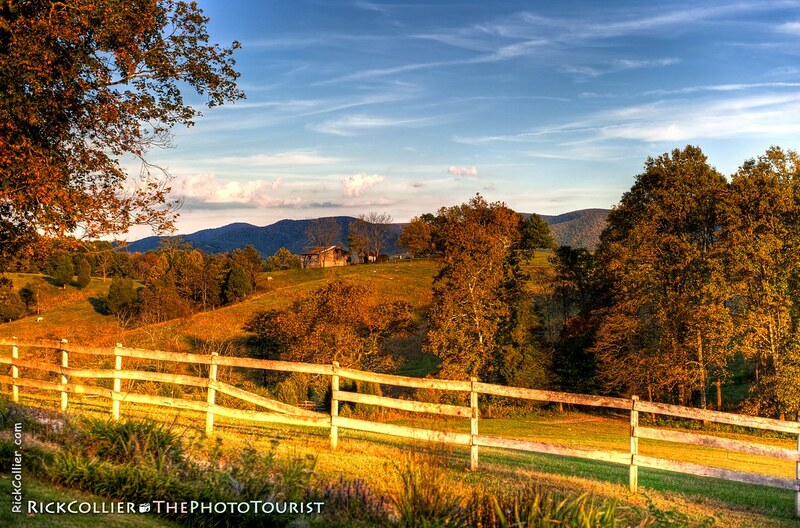 (HDR image of fence and fields at sunset, in Fincastle VA.) Yesterday evening we found ourselves in Fincastle, Virginia, rolling up near closing time at Fincastle Vineyards and Winery (also a B&B). Nancy hurried into the tasting room, hoping we weren’t too late. I had to pause. The long rays of the sunset light brought extra warmth and glow to the early fall scene, turning the white picket fence a little yellow and emphasizing the occasional fall yellow or maroon reds (not yet at full glory, but just a little more dramatic for their sudden appearance in a landscape that is still mostly green). Creative Commons License: All content copyright © Rick Collier and thePhotoTourist. Watermarked images may be shared without modification; with attribution and link-back; and for personal use only (not for profit or commercial use). All commercial rights reserved. See "About" for use terms. "The Photo Tourist" in this case is Rick Collier: a photographer and writer who has spent over three decades traveling the world, writing, and making images underwater and of destinations, landscapes, nature, and historic and cultural subjects. This is my blog about traveling and photography and what happens when they meet; about worldwide destinations and learning experiences. Photos and text copyright © Rick Collier, thePhotoTourist, & Rick Collier Imagery. Design by Graph Paper Press. Background by Vlad Gerasimov (www.vladstudio.com).